Burgers are an American classic, and there aren’t just Big Macs and Whoppers anymore. Area restaurants offer all kinds of speciality burgers. The Wingspan staff took on the challenge of finding the best burgers less than 30-minutes away. The four contenders were Five Guys Burgers and Fries in Asheville, BT’s Burger Joint in Biltmore Park, Burgerworx in Hendersonville and Juicy Lucy’s Burger Bar and Grill in Asheville. BT’s Burger Joint is located in Biltmore Park south of Asheville. Restaurant customers can build their own burger starting at $5.60 with cheese for 75 cents extra. Other toppings are free. There are also speciality burgers, hot dogs, salads, grilled cheese sandwiches and more. There are three other locations in Charlotte. BT’s also has a challenge called the 40/20 challenge where they provide the 40-ounce burger and give the participant 20 minutes to see if he or she can finish it. Customers seat themselves after ordering at the counter, and food is brought to the table. BT’s has many healthier options that still taste great. I would give it 4 forks out of 5. Five Guys Burgers and Fries at 1838 Hendersonville Road in Asheville is a fast food restaurant chain that has a won numerous “best burger” awards with good reason. Tables and chairs are set up with bins of peanuts for anyone to snack on while they wait. The burgers are delicious and the fry portions are huge. A regular hamburger is $6.19 with a large selection of free toppings. The restaurant that also offers smaller hamburgers and cheeseburgers, as well as fries, hot dogs and sandwiches. Five Guys has locations across North Carolina, including in Charlotte and Boone. This is definitely the best fast food burger I’ve ever had. This is a good stop for anyone in a hurry. I’d give it a 4.5 out of 5 forks. Burgerworx is a local place similar to BT’s. The restaurant customer can create his or her own burger, starting at $4.19, with free toppings and cheese for an additional 75 cents. Speciality burgers are available, including the BBQ burger. They have veggie burgers, chicken sandwiches and hot dogs. This restaurant is relatively new to Hendersonville at 638 Spartanburg Highway. Burgerworx also has a downtown Asheville location. The service was very friendly and welcoming. I would give them 3.5 out of 5 forks. Juicy Lucy’s Burger Bar and Grill is a sit-down restaurant at 620 Hendersonville Road in Asheville. Juicy Lucy’s has monthly burger specials, along with their everyday speciality burgers and the option to build your own burger. The restaurant also serves wings, hot dogs, pork options, grilled sandwiches, salads and more. The basic burger starts at $7.95 with free condiments and cheese. They even have stuffed burgers, which are burgers with cheese stuffed into the center of the patty. The burgers are fairly big and taste great. This is a good stop for someone who has a big appetite. I would give this restaurant 5 of 5 forks. All four area burger restaurants served delicious and reasonably priced food, but my favorite spot was Juicy Lucy’s Burger Bar and Grill. They have the largest selection of food and the prices are reasonable for a sit-down restaurant. The atmosphere has Southern charm and is family-owned. There are plenty of healthy options and vegetables come from local farms. 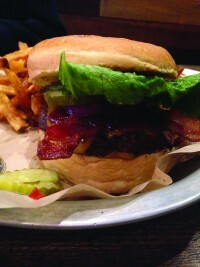 Juicy Lucy’s would be the perfect place for date night or a casual lunch.